Dramatic weight loss whether achieved by proper nutrition and exercise or as the result of weight reduction surgery has many obvious health benefits. However, once you reach your target weight, you may find that you still do not have the fit and healthy body image you desire. Skin may be loose and sagging and, in many cases, your body contours may appear irregular and disproportionate. Over the past few years, bariatric surgery, often referred to as gastric bypass surgery, has become a common method of massive weight loss for clinically obese individuals. Often 100 or more pounds are lost. 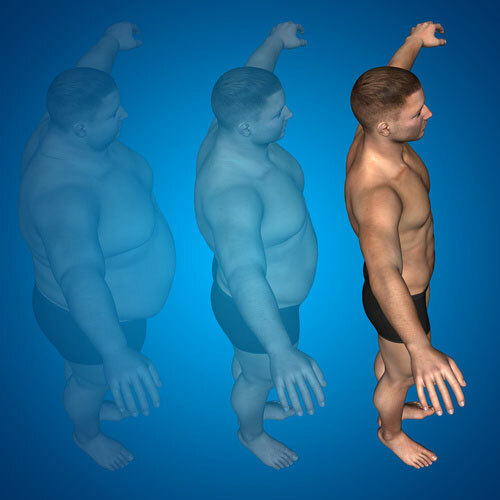 After such massive weight loss, the skin and tissues lack the necessary elasticity and cannot conform to the reduced body sizes. As a result, the skin that has been severely stretched now is unsupported, and creates redundant folds and pockets. Skin that folds upon itself can become macerated (wet and infected) and is not only unattractive but also a potential hygiene and health problem. Surgical body contouring following massive weight loss improves the shape and tone of the underlying tissue that supports the overlying fat and skin, while also removing excess sagging fat and skin. The result is a more normal appearance to the body, with smoother, more proportioned contours. These body contouring procedures are in essence the final surgical phase of the total weight loss experience. It is important that weight be stable for at least 6-12 months before undergoing body contouring procedures. Additional weight loss may lead to further skin looseness while weight gain can create stretch marks and widened scars. The types of body contouring procedures span the entire body from the face down to the knees and calves. Many patients require multiple, staged procedures to address all of their areas of concern. Often, it is the body contouring procedures that are more complex than the actual initial bariatric surgery. In many cases, healing can be slow due to nutritional issues related to the bypass procedure. Complications are typically more frequent than in non-bariatric patients and the final results can also be compromised due to the universally poor quality skin and tissues. It is imperative that candidates for these procedures understand their complexity and above all have realistic expectations regarding their final aesthetic outcome. With this in mind, however, the results can be dramatic and gratifying for both the patient and surgeon. For additional information about specific body contouring procedures, refer to the specific sections of this website.